China is cleaning up its act at home, but will leaders be willing to tackle illegal environmental depredations abroad? The recent University of Georgia study reporting that China is responsible for as much as 28 percent of plastic waste in ocean waters— making it the largest contributor to the problem worldwide — underscores the broader challenge of the country’s global environmental footprint. Some problems, such as the plastic waste or air pollution from China that travels across the Pacific, directly reflect China’s own environmental problems; as China addresses these problems on the home front, other affected countries will also benefit. Yet there is another set of global environmental challenges related to the depletion of the world’s natural resources. Tackling these issues will require China’s leaders to adopt policies that won’t necessarily bring an immediate environmental or economic benefit to the country. Instead, they will have to take as their priority the preservation of the global commons and protection of the developing world’s natural resources. While China may pay a financial cost for adopting such a priority, it will put the country on a path toward becoming the responsible global power it aspires to be. China is a significant contributor to the depletion of a number of the world’s most precious natural resources. It is, for example, an important — indeed perhaps the largest — source of overfishing and illegal fishing globally. Scientists at the University of British Columbia estimate that of the 4.1 million of tonnes of fish that China catches off the coasts of other countries, only 9 percent is officially reported. Whether the fishing is legal or illegal (and some of it most certainly is illegal), the failure of Chinese fishermen to report their catch deprives countries of the ability to develop the proper conservation policies. Violence can also accompany this illegal fishing activity. In late 2014, for example, Chinese fishermen threatened members of the Korean Coast Guard with knives and beer bottles and even attempted to choke one of them. The situation took a turn for the worst when one of the fishermen was shot and killed. China’s role in illegal logging is also a long-standing concern. Over the past decade and a half, as China has sought to protect its own forests, it has become both the largest importer of timber and the largest importer of stolen wood. According to one estimate, as much as 20 percent of Chinese imported wood is illegally sourced. In Myanmar, where Chinese logging enterprises are very active, forest coverage has dropped from 60 percent in the 1970s to as little as 20 percent in 2013; the Myanmar government recently arrested more than 100 Chinese loggers who were suspected of illegally entering the country. Although attention to this issue within China has risen significantly over the past few years, Beijing has yet to put in place any significant domestic legislation or signed any agreements to curtail the flow of illegal wood products into the country. In addition, the illegal trade in endangered species and products is driven in large part by Chinese demand. 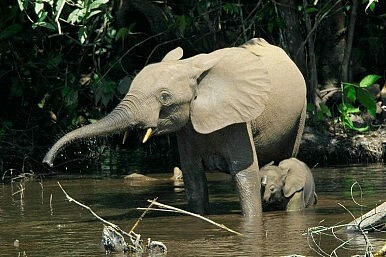 Demand for ivory from China, for example, is a major contributor to the devastating poaching of elephants in Africa. Chinese traffickers acknowledge that 90 percent of the Chinese ivory market is illegally imported. Despite increased arrests and awareness campaigns by Beijing, the problem persists: in Beijing and Shanghai, respectively, at least 78 and 89 percent of outlets selling ivory are illegal. The London-based Environmental Investigation Agency even accused an official Chinese delegation of transferring large amounts of illegal ivory from Tanzania back to Beijing on President Xi Jinping’s plane in 2013. Although China’s state Forestry Administration announced a one year moratorium on the import of ivory carvings in late February 2015, wildlife experts argue that it falls far short of the total ban on domestic trade in ivory that is needed to make a real difference. At the heart of this illegal depletion of the world’s resources is a combination of greed, official complicity, and weak governance, both in the resource-rich countries and in China as well. Chinese officials often claim as their first line of defense that they are not responsible for these environmental problems — it is the responsibility of the host governments to protect their own environments. Some countries indeed have tried to take matters into their own hands. Indonesia, for example, confiscated dozens of Chinese-linked fishing vessels in 2014. It also revoked a deal that it had signed with Beijing in 2013 that gave Chinese fishermen an advantage over other foreign fishing interests. And Ghana deported thousands of Chinese gold miners whose mining practices were devastating the environment. Yet in many cases, governance in the resource-rich country is weak and often corrupt, helping the illegal trade in resources to flourish. So what could or should Beijing do? Even without acknowledging culpability, Beijing could do much to ensure that its businesses, whether private or state-owned, become responsible global actors. For example, Beijing could follow the lead of the European Union, Australia, and the United States to pass legislation that bans the import and trade of illegally sourced timber; it could ensure that Chinese fishermen report their catch accurately; and it could ratchet up the strength of its customs inspections at ports and other well known border transport points for endangered species and illegally-logged timber. Such actions, in fact, should be a natural extension of China’s own domestic efforts to enhance transparency and the rule of law. Chinese President Xi Jinping took an important step forward at the November APEC summit to support the protection of the global environment by pledging that China’s greenhouse gas emissions will peak around 2030. He was uniquely positioned — along with President Obama — to make a real difference in the world’s environmental future. He should not stop now, but should position himself as a leading force for global environmental protection. Indeed, the fate of the world’s natural resources depends on it. Does China Still Want to Be a Global Environmental Leader? Amid tensions with the United States, there are dark clouds ahead of China’s climate agenda.